Margaret Atwood gave a lecture at Kingsbury Hall, covering topics as diverse as human nature and technological progress. 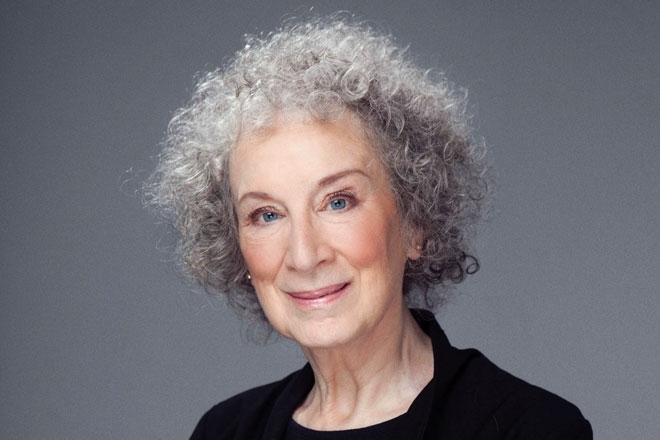 Born in Ottawa, Canada in 1939, author Margaret Atwood has spent the majority of her life writing on topics such as feminism, the progress of technology, culture and preserving Earth’s environment. During her undergraduate studies at the University of Toronto, Atwood self-published her first book of poems and since then has published over 82 literary works in virtually every genre—including novels, children’s books, poetry, TV scripts and theater—to popular and critical acclaim. As a world-class author and public intellectual, Atwood shared her lifelong child-like curiosity about life with a full house at the University of Utah’s Kingsbury Hall. Under the gaze of a passively painted William Shakespeare, the buzzing crowd began to gather. Women in their 50s sporting bobs tightly gripped their copies of The Handmaid’s Tale, Oryx and Crake and The Blind Assassin. College kids took quick snapchats of themselves and of the older men who stood talking loudly in the aisles. The hinges of the red clothed chairs groaned noisily as the excited crowd constantly moved and twisted with the overhead piano melody. The lights of the auditorium dimmed and the lone podium on the stage became a bright pillar of fluorescent wood against a pitch-black background. Margaret Atwood was introduced and welcomed on stage by David Pershing, President of the University of Utah. The atmosphere heightened as Atwood took the stage and the crowd rose to give her a standing ovation. Standing for a moment—patient and erect—Atwood began to slowly and meticulously scan the crowd. The audience fell back into their chairs, greeted by a loud groan of iron hinges, and awaited the lecture. Atwood began her lecture by addressing the difficulty one has when confronting the ideas of human values in an age of change. From her small leather bag, she removed a thick stack of papers. She began to read in a strong rhythmic voice like a parent telling a child a bedtime story—with soft and subtle tones that had the potential to lull one to sleep, despite wishing to stay completely involved. She ended with what she believed to be the long lasting technology of mankind and its greatest value—narrative. Throughout history, mankind has been able to tell stories and relate its plights to the next generation so that it may grow. “In ancient days,” said Atwood, “people could barely count, but almost everyone had their culture’s stories memorized.” She claimed that this fact added to the overall importance of story and narrative. From these stories, political, religious, scientific and artistic views of the world were formed. “Science can tell us what we are—molecules and carbon,” she said, “but who we are is another question altogether—and that’s for art.” Art is the expression which brings the unexplainable to the people. “We are all a part of humankind,” says Atwood, “and these values live in art.” She paused, lowering her bulletproof stack of papers, her eyes, encapsulated by her pink-framed glasses, turned directly out to the crowd. Atwood began reciting the poem No Man Is An Island by John Donne. Atwood smiled as a silence that comes from deep understanding of new information hung heavy like fog in the auditorium. Atwood ended with these immortal words of Donne because they center around her idea of the human experience through narrative. Narrative is the essence of the human condition through perseverance. Through narrative, humans are able to build upon themselves from the words of others. Grand stories, theories and philosophies of existence are all extracted from Donne’s human continent. That is why the most important human value in a time of change is narrative. The fog of silence dissipated as the house lights were turned on and Q&A format began. A few people ran quickly toward the two mics and others walked slowly—weighted by the fear of asking a question of a famous author. The questions all followed a similar framework—what advice she had for writers and how to write. Atwood was cheerful and funny as she answered, saying that if one writes, they are a writer—the best way to write is to just write. Her vivacious attitude abounded fully as she interacted with the crowd. The questions were abruptly ended as Pershing came back on the stage, urging all in attendance to go to Atwood’s book signing at King’s English. The crowd flooded onto President’s Circle like a massive tidal wave. Couples walked briskly—between the clustered groups who talked on the sidewalk—as they tried to beat the crowd to the book signing. A feeling of appreciation and insight permeated the crowd as many gave voice to their delight with the lecture. A disgruntled feeling slowly seeped its way through as some loudly complained about the egregiously simple questions which were imposed upon the esteemed author. Many agreed with Atwood about the positive and negative aspects of narrative and art. The theme of narrative and lasting effects in a time of change allowed for many to walk with a confident gait as Dickens, Donne and Atwood floated through their minds.